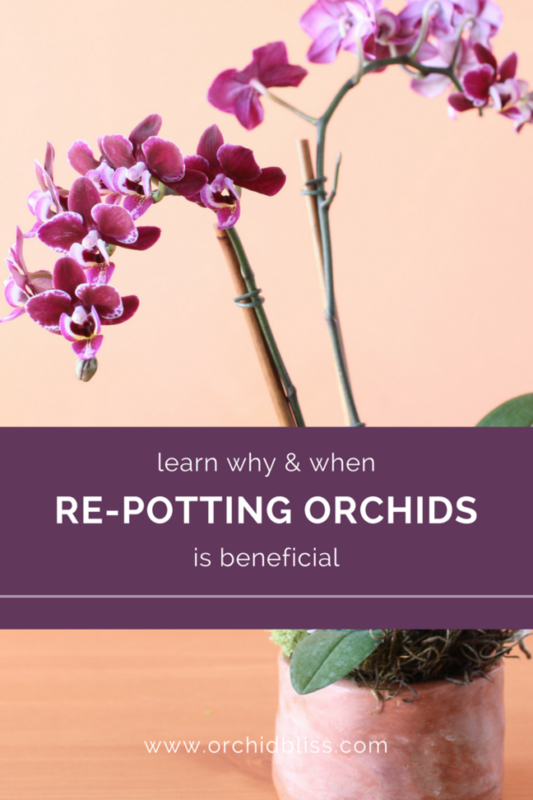 Before diving right into re-potting, it is important to know why and when to repot orchids. Knowing the answers will determine if you really need to, or not. 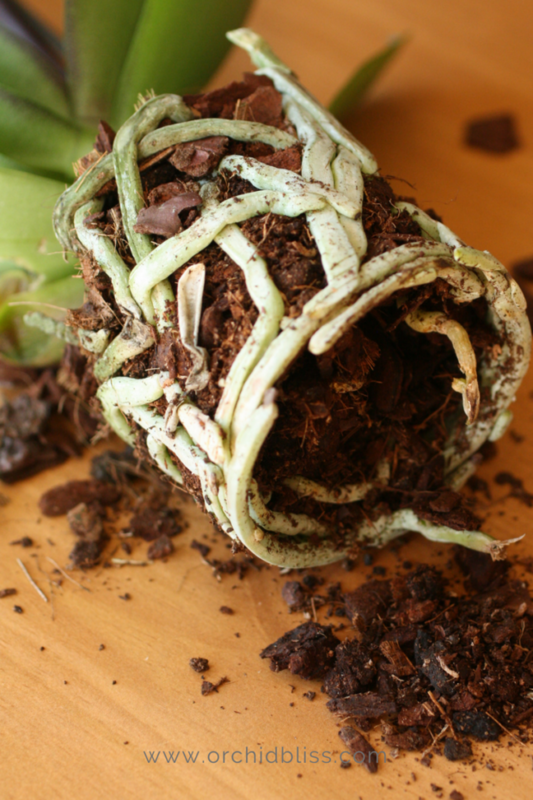 Because orchid roots are so different from other plant roots, it can be an intimidating prospect. Thankfully, it doesn’t have to be. Instead, it can be rather fascinating. 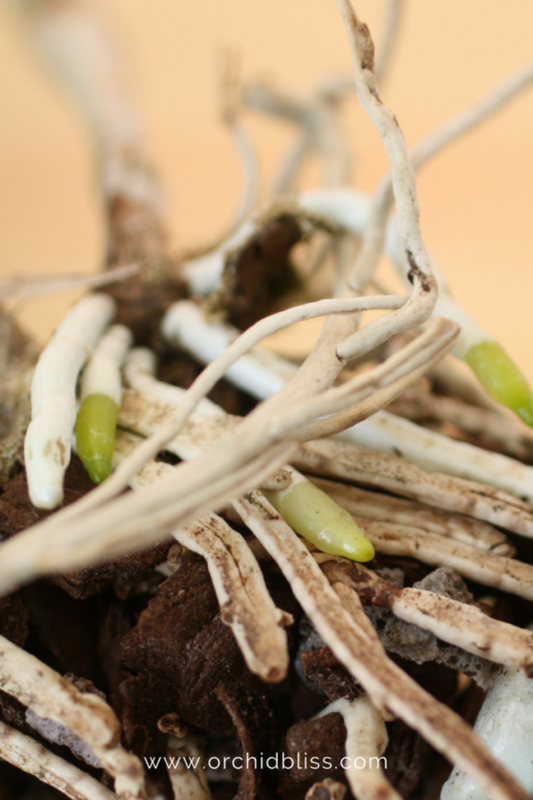 Orchid roots are thick and firm, not the web of tiny roots of other plants. (Or, at least they should be. 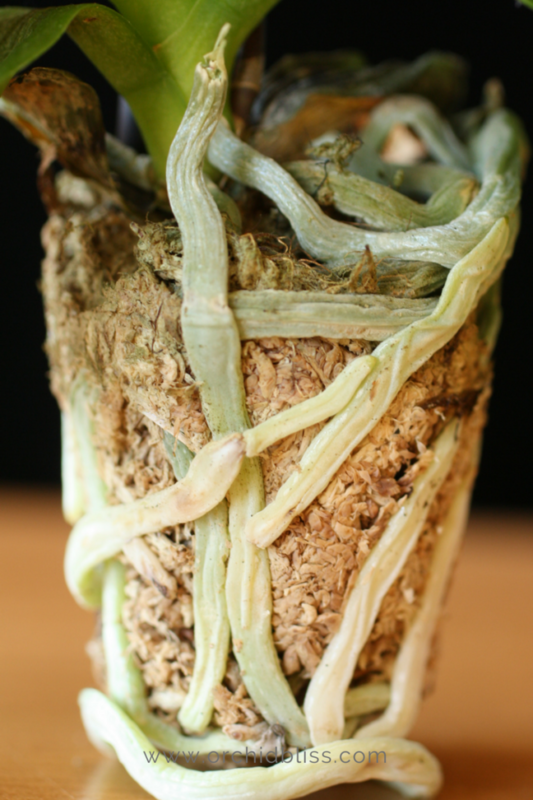 Over-watered orchid roots will quickly become mushy and slimy.) New potting media will give your orchid a fresh start in clean media that is best suited for your orchid’s overall well-being. Overtime potting media breaks down minimizing air flow to the roots, and fertilizer salts build up, creating an unsuitable growing media for orchids. If your orchid came in sphagnum peat moss the best time to re-pot is as soon as the plant is finished flowering. Many plants are potted in this media because it is a great way to ship the plants. The moss keeps the orchid hydrated and the roots in place. But, it is not the best media for long-term plant care. Orchid roots need air circulation, which they cannot get packed in the moss. Wood-based potting mixes are a popular choice for potting orchids because they allow for air flow around an orchid’s roots. 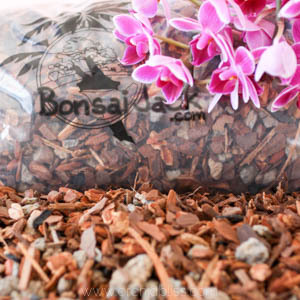 The wood-based mixes are often supplemented with materials, such as horticulture charcoal and perlite, that retain and slowly release water to the orchids roots as well as prevent compaction around the roots. Orchids potted in wood-based potting mixes require watering much more frequently than those potted in sphagnum moss. If you are accustomed to sphagnum moss and switch to wood, you will be surprised by how much more frequently you will need to water. 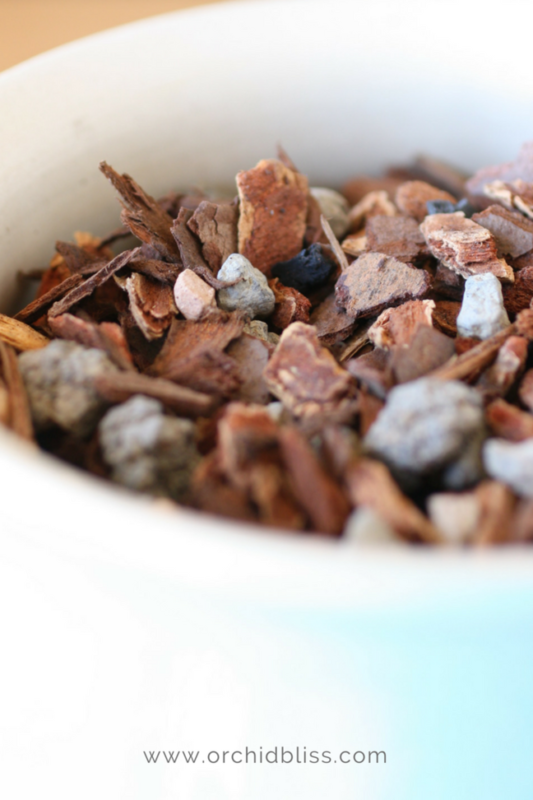 If you tend to have a heavy hand with water, then wood chips will definitely suit your care-style. As time goes on, the wood chips become more water absorbent and you will not need to water as frequently as you did in the beginning. Additionally, wood chips breakdown over time. Watering is a convenient time to check your potting mix. If you see what looks like coffee grounds, the wood has begun to decompose. Salt is the carrier for minerals in fertilizer. While the minerals are necessary to support the health of the orchid, salt is not. Over time, too much salt accumulates in the orchid soil. 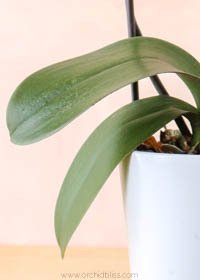 If you notice that the tips of your orchid’s leaves are brown and dry, it may well be that the soil has too much salt. Regularly flushing the orchid with water, and then afterward, fertilizing will help keep salt buildup at a minimum. But eventually, the soil will need to be replaced. 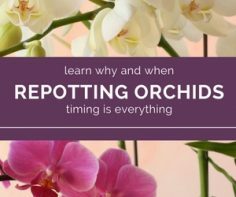 Now that you know why you should re-pot your orchids, let’s take a look at when to repot orchids. There are three main indicators to watch for that tell when it’s time to pot your orchids. The first is the hardest of all: before the soil has broken down. Waiting until the soil has actually broken down is waiting too long. Think of it this way, if you know your roof is old and it won’t be long before it leaks, it’s best to re-shingle for the leaks start. If you wait until the soil breaks down, the health of the roots will already be compromised. The second two indicators are easier to recognize: after the orchid has finished blooming and when the orchid begins putting forth new roots. If you have purchased your orchid from the grocery store, chances are your orchid was potted in a minimum grade orchid potting medium. Don’t re-pot immediately. Wait until after all the flowers die, then the orchid is ready to be re-potted. After my orchids have finished blooming for the first time, I re-pot them using a quality orchid wood-based potting mix. There are two exceptions to this rule. First, I do not re-pot my dendrobiums. They do not like to be re-potted and I don’t want to run the risk of losing my plant. Second, I think twice about re-potting orchids I’ve purchased from an orchid show. These sellers usually care a lot about orchids and are not into mass market orchid production and more likely to plant their orchids in quality potting media. After purchasing at an orchid show, examine the medium, and if looks good–if it’s not breaking down and the plant looks awesome, I recommend waiting to pot. On the flip side, many orchid growers like to re-pot their orchids right after purchasing so that they can check out the orchid’s roots. For those of you who like to check out the orchid’s roots first thing after purchasing, try to purchase an orchid not currently in bloom. If you can see new roots emerging, that is the best time to re-pot. This tells you that the orchid is actively growing and helps to ensure that the roots will become established in the new pot. However, even when new roots are visible, wait until the plant finishes blooming before re-potting. Knowing when to re-pot orchids depends on several factors. By considering the following recommendations, you will make the decision that is in the best interest of your orchids. determine when the current potting media will become unsuitable, then plant to pot before it breaks down. wait until the plant has finished blooming. be hesitant to pot if the orchid is a Dendrobium, as they do not like being re-potted. new roots are the best indicator that the plant will do well after re-potting. Orchids can live and bloom for many years. Making the investment to re-pot an orchid that is planted in unsuitable soil will help to ensure your orchid will thrive, supplying you with the unusual beauty that only orchid flowers provide. Yes, several orchids can be placed together in a larger pot. Although, I do recommend keeping each orchid in its original clear, plastic pot within the larger pot. 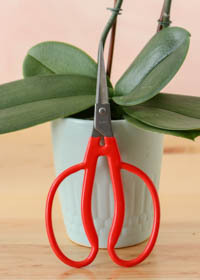 After placing the orchids in the larger pot you may need to fill in the gaps with floral foam to stabilize the orchids. Once the orchids are stabilized, add preserved moss to finish the display. The reason for not removing the orchids from the clear, plastic container is so that you can check on the roots and health of the orchid. Orchids like to be crowded in their pots, so a larger pot with several orchids may inhibit blooming. Also, if one orchid isn’t in bloom you can switch is out for another that is. That said, if you’d like to remove the orchids from their clear, plastic pot and see how they do, go ahead. Gardening is all about experimentation and you may really like the result. I reported mine in glass containers. Can still see roots but more decorative. When the air roots come out top and are shriveled, do they need more or less water? I haven’t ever used glass containers for growing orchids. Let me know how it goes. I don’t worry too much about the aerial roots. I just let them do what they want. You could increase the humidity around your orchids to see if that helps the aerial roots to look more hydrated. How frustrating! Don’t give up! Bud blast, when flower buds die before opening, is the more common problem among orchid growers. When your orchid is getting ready to bloom, use care to protect the orchid from drastic environmental changes such as fluctuations in temperature, water and humidity. Yes! Definitely wait until the orchid has finished blooming until you repot. There are two basic orchid pots, one with holes on the sides and bottom, and the other option is a plastic liner pot with drainage on the bottom. Clear pots are usually set inside an outer, decorative pot. Both types of pots work well and I use both. The advantage of the clear pot is that you can see the roots and potting medium and more easily check for signs of over-watering. I have used both. I am praying for your orchid to bloom for you! Sure, dry,shriveled roots can be trimmed off. Sounds like you have everything ready for repotting! I am glad that your orchid listened to you when you asked it to bloom! If fertilizer is causing yellow leaves, fertilize sparingly, just once or twice a month at 1/4 strength. If your leaves look good, stiff and upright, you are probably watering correctly. The main reason orchids don’t bloom is insufficient light. If possible, place your orchid near an east-facing window. A south-facing window with a sheer curtain will also work. If you’re noticing leaf growth that is a good sign. This means the orchid is growing as it should. It may take several months, but with enough light, your orchid should bloom. Do you know the name of your orchid? 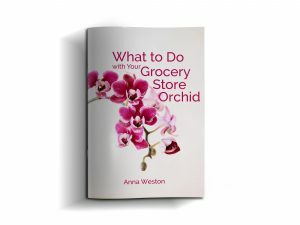 I could give you more specific information based on the variety of orchid you are growing. Sounds like your orchid is doing well! Could you email me a picture: [email protected]? I love to take a look. Can anything be done for Cymbidiums with scale? They were gifted to me, with scale. I kept it at bay, but health issues stopped me for a while! Wishing good health for you and your orchids! I’m very new to orchid growing and I love it. Your information has been extremely helpful. Maybe you’ve answered this question in other areas of your website, but I haven’t been there yet. I found this information on Pinterest. I’ll be going to your site soon so I can understand even more, but can you tell me how often I should fertilize my plants and what you recommend to fertilize them with? Thank you so much! It was so great to hear from you! Thanks for your question about fertilizing orchids. Follow this link to learn about fertilizing orchids. My orchid is always blooming but the leaves on one of them seem very droopy. Is this ok? Once the orchid has finished blooming, you can re-pot it. This is your opportunity to find out the condition of your roots. If your orchid is potted in sphagnum moss, you can water it every couple of weeks, Bark-based potting media needs water more frequently,at least once a week. Likely you are either over-watering or under-watering. You’ll know for sure after checking out the roots. After potting, adjust your watering schedule accordingly. You won’t notice an immediate change, but after a few weeks, you should see an improvement. Hi there..Berni here… very informative site ..thankyou.want to know what yo do with the long stems once the all the flowers gave died…di i cut them back..short? The short answer is: “Yes, cut the flower spike back at the base.” That’s what I recommend for the most abundant flowers. Hello Berni. I have a double stemmed orchid which flowers beautifully. I am thinking of repotting this time after flowering. At the base where old leaves and stems have died and been cut away it looks very dry. On saying that new roots are just pipping from this area quite high up and I am wondering if when I repot how deep should I go. Will it be okay if I repot a little deeper so as to hide the ugly dry bits. The rooting in the pot is all healthy looking but the base of the plant spoils the look. I have had the plant for three years and would hate to lose it now as it has gorgeous white flowers when in bloom. Pauline. I have an orchid I bought on clearance at the grocery store. I’ve had it for about 3 years, it has never been without a bloom. When the last bloom from one stem falls another stem is blooming. That is ONE of the reasons I love orchids so much! They are truly flower powerhouses! Sounds like you are doing a great job caring for your orchid! I just found your site and find it very informative. My situation is I live in Fl and will be leaving my orchids outside in a screen house with timed watering for three months this summer. When I return and find flower spikes, will bringing them back inside for my enjoyment cause buds to blast? Any suggestions on my summering of them? Your orchids are least likely to experience bud blast if you wait until the flowers have opened. I’m just wondering if you’ve had a problem in the past. If you haven’t you’re probably okay to just bring your orchids in. But, if you’ve had a recurring problem, wait til they flower to bring them in. I just repotted my small orchid for the first time. I did not soak the bark first. Now I’m wondering if I should water it, or should I wait a while and if so, how long? Also, since I just repotted it, how long should I wait to fertilize it? (I’ve been very bad and have never fertilized this orchid. It had flowers when it was given to me a couple of years ago but it was knocked over and lost the flowers. Since then it has leaves but no blooms.) Thanks! Yes, now is a good time to water your orchid. Also, if you are growing a Phalaenopsis orchid, you could poke some sphagnum moss in to the potting mix to help it retain more moisture. Give the orchid good light, and the potting mix damp, but not too wet and, hopefully, in a few months your orchid will give you some flowers! Do Orchids have to be in a plastic pot liner or straight into a regular pot and are clay pots ok ? Orchids can be grown in both plastic and clay. The advantage of clear plastic is that you can see the potting medium and the roots. Also, if you live in a dry climate, a plastic pot will keep the roots from drying out as quickly. Click on the link below to learn more about using plastic orchid pots. Clay pots are also suitable for orchids. Terracotta allows for air circulation to the roots and the pot leaches fertilizer salts away from the roots. On the downside, clay pots prevent you from being able to see the roots and roots do stick to terracotta. Click on the link below to learn more about using terracotta to pot orchids. Both clay and plastic are good for growing orchids, just be sure you have good drainage. I have several “Phalaenopsis” orchid plants. They are facing East side .Once the flowers die the leaves become limp and shrivel up. I place 3-4 ice cubes per pot every week. Thank you for your comment. It sounds like your Phalaenopsis are getting enough light. It sounds like you may need to fine-tune the amount of water you give them. Limp leaves signal both over and underwatering. Once the flowers have completely faded, that is a good time to repot. If you notice that the roots are hard and brittle, your orchids need more water. But, if many of the roots are dark and limp, you are overwatering. Follow the link below for more information on what to do about limp orchid leaves. I a have Phalaenopsis. It has two new roots and new leaves. It is not blooming. What to do? Should I re-pot? Advise. 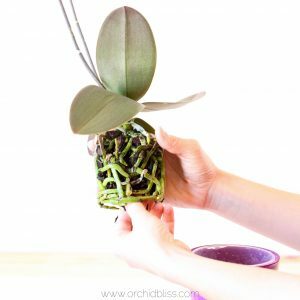 Congratulations on your new leaves and roots, those are signs that your phal is doing what it is supposed to do – all part of a healthy growth cycle. I’ve never replanted my orchids but all of them repeat flowering after a couple of months. I do feed them every 3 months. Ihave about 10. Should I replant and will this produce more flowers per pot? First off, congratulations on successfully growing flowering orchids! Orchids do benefit from periodic potting every year or so. The main benefit of fresh potting media is that it does not fertilizer salts, and is not compacted, which allows plenty of air to the orchid’s roots. 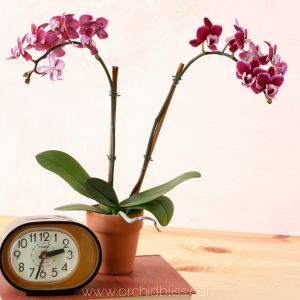 Keep in mind, that the orchid will need time to recover from potting and you may miss a bloom cycle. In the long run, you will grow healthier orchids. Anna,I have not seen this question before, so thought I would ask. What do you think about growing orchids in a vase of water with no soil or bark. On plant sites numerous people are successfully growing them. So I tried it. My Phal had not bloomed fir me after the first time so I thought I had nothing to lose. I cleaned off the roots and put them in a vase of water being careful to not set the base of the orchid in the water. Just the roots. Well, it bloomed for me after a month. Then the next year it has bloomed again. Two flower spikes this time. I had given up in the plant until I saw this post of the plant group. What do you think about doing it this way? Thanks for asking about growing orchids in water culture. This is something that I have never tried, but it sounds like you have been very successful. How often do you change the water? I will definitely put water culture on my list of things to try as I am always experimenting with my orchids. When you re-pot, do you increase the pot size? As orchids like their roots crowded in the pot, often the pot can be re-used. However, especially is the orchid has not yet reached maturity, then it is a good idea to go up a pot size. So my orchid is about a little over a year old, after the 1st bloom i cut the steam down and have gotten another bloom. But at the end of each steam i have what i believe is keyki but on each new plant is only one root coming out! What do i do??? The longer the keiki is attached to the mother plant, the better it’s chances of survival. When the roots are a few inches long you can remove the keiki and pot it up. Don’t worry about leaving the keiki on the mother plant too long. Wait a while longer to see if another root will grow. My orchid is on water and always blooming do I need to fertilize it? I have several orchids but they always have issues and I’m not sure if they are under watered or overwatered at this point. One of them has fabulous flowers but the leaves are shrivelled and leathery looking- how can I help this orchid. To check to see if you are over- or underwatering, take a look at the roots – the ones growing in the potting medium, not the aerial roots. Healthy roots are plump with green or sometimes even magenta tips, underwatered roots are brittle and tan-colored. Overwatered roots are soggy, mushy and can be dark brown or black. I’ve purchased products from RePotMe and their products are of high quality. That’s fantastic! Congratulations! And, thank you in advance for the photos. I can’t wait to see them.